Create a lasting new interior upgrade in your home with stylish and durable vinyl flooring. When you need a floor covering that can withstand the traffic that comes with children and pets, vinyl sheet flooring is the answer. If you are in the market for a flooring option that is easy care and well-suited to any room in your house, our vinyl tile flooring is the solution. Getting the durable flooring that matches your lifestyle is easy with the broad selection of styles, colors, and textures we carry in our expansive showroom. Our design specialists and friendly sales associates are here to help you find the flooring that best suits your needs in looks, performance, and price. Whether you are restoring the look and feel of a bathroom, or you are covering a new floor for the first time, we can help. You won’t have to sacrifice the style and color you want just to get the value you expect. Vinyl tile floors are versatile and economical, and they mimic the classic feel of traditional flooring options like ceramic and plank flooring. You get the gleam and shine of hardwood without the cost and care involved. When choosing a type of vinyl floor covering for your kitchen and bathrooms, you need a surface that can withstand the effects of moisture. This flooring material resists a great deal of water penetration, which makes it ideal to use in high-moisture spaces such as bathrooms, kitchens, basements, laundry rooms, or other high moisture space in the home. With a solid section of flooring cut directly from the sheet, you get an unbroken surface that is easy to clean and maintain. It is stain-resistant and known for its ease of care and maintenance. Just sweep and damp mop when needed; no waxing needed. That is all this flooring requires to look its best 24/7. Should you face any damage to your tile flooring, each tile is simple to replace as well. This also ensures you get a consistent design pattern across the entire surface you are covering. 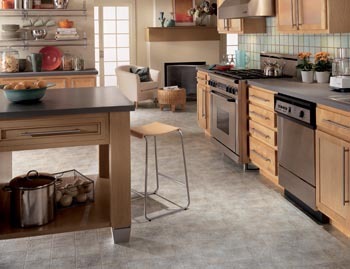 Expand your design horizon with our color and pattern options for vinyl tile flooring. You can even combine patterns to make your own distinct look. Create a distinctive look and pattern with vinyl tiles that. If the classic subway tile pattern appeals to you, for example, this flooring option is the way to go. The versatility of printed vinyl allows for many design possibilities. Enjoy the look of hardwood, natural stone, porcelain, and more. Get vinyl plank flooring that has all the feel and function of classic hardwoods, complete with the realistic look of grain patterns and finishes. This approach to flooring makes a statement about your level of style and sophistication and you save money in the process. You also get a flooring option that is easy to clean as well. Choose a surface that can look great for years to come. Manufactured from man-made materials, vinyl is renowned for its durability. Layered construction makes this flooring tough enough for daily wear and tear from children and pets, yet it still looks gorgeous. With a protective coating and strong bottom layer, vinyl is made to last. To realize the most from your flooring investment, it is essential that you work with our professional vinyl flooring installation specialists. The quality of your installation is as important as the quality of your flooring materials. The right fit can make a huge difference in the life of your floors. Any seams in your flooring can cause moisture to seep in, and this can cost you dearly in the long run. We are committed to your satisfaction, which is why we back every installation with our Ultimate Confidence Guarantee. Let us know within 30 days of installation if you aren’t satisfied with your floors, and we will replace them with a similar product at no cost to you. Our focus on your complete satisfaction is centered on building a lasting relationship with you. Contact us for a free estimate on the vinyl flooring you have always dreamed of. We proudly serve the communities of Charlotte, Pineville, Sun City, Waxhaw, and Tegacay, plus all of the surrounding areas.